The index opened up on the back of good global cues and stayed in the green for the entire session of trade to close at 7975.50, gain of 42.60 points. The broader market though was negative, with 754 advances to 800 declines. The range for the series is still at 7900-8200. Call option 8200 added huge 4.87 lacs OI with profit booking seen at 8300 and above strike prices. Put option 8000-7500 added 19.21 lacs OI with short covering seen at 8100 and above strike prices. Nifty Open Interest is at 1,26,36,000 down by 2,82,800, whereas Oct series added 1.70 lacs with increase in price, probably rollover with some short covering. Bank Nifty Open Interest is at 16,52,500 down by 1,70,400, whereas Oct series added 0.23 lacs with small decrease in price, probably some rollover with huge long liquidation. FII’s bought small 0.65 lacs Futures, which includes contracts 5998 long liquidation and 7290 contracts short covering, with decrease in net OI by 13288 contracts (includes 41898 longs to 40606 shorts for the day) and the average price per contract comes to around 7989.57. 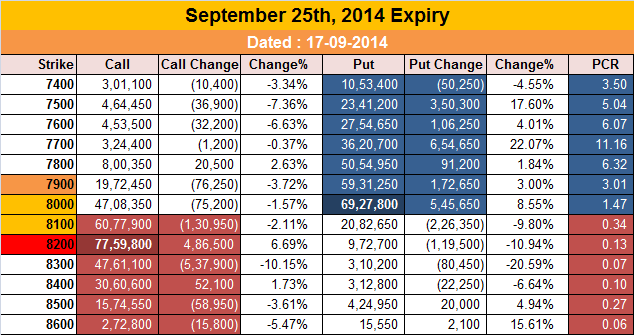 FII’s Index future open contract as on date is 163865 Longs to 71493 Shorts, net long 92372 contracts. 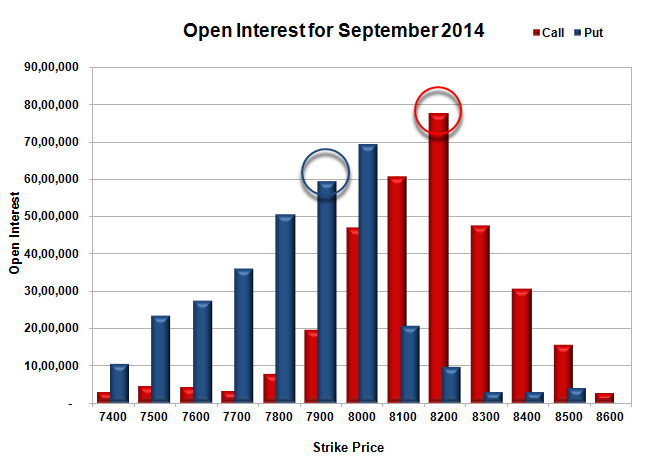 Initial support still at 7900, with huge OI of 59.31 lacs and below that at 7800 with OI of 50.55 lacs. 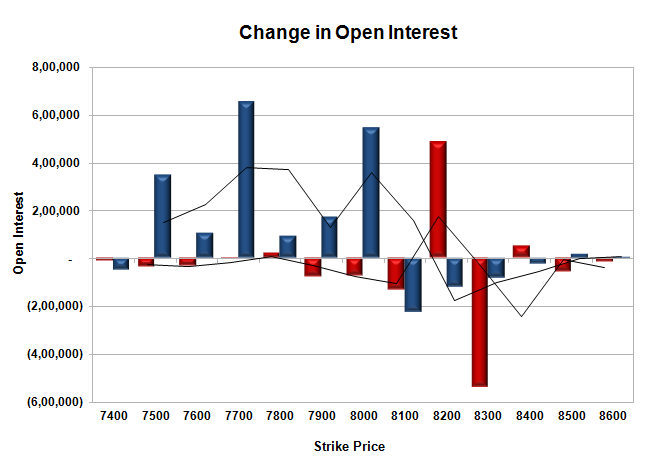 Initial resistance at 8100, with huge OI of 60.78 lacs and above that at 8200 with highest OI of 77.60 lacs. 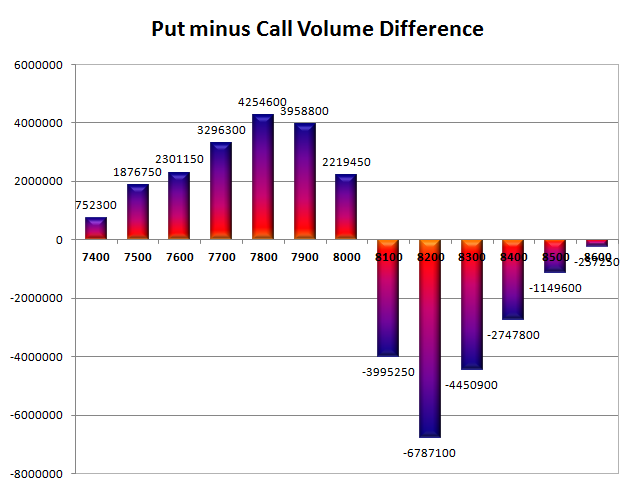 Day Range as per Option Table is 7919 - 8024 and as per VIX is 7921 - 8030 with 7968 as the Pivot.